ABU DHABI, United Arab Emirates — Pakistan has "a desire to change" its ways and be removed from an American blacklist of countries that infringe on religious freedoms, a U.S. special envoy said Sunday on a tour of a Mideast long riven by faith. Sam Brownback, the U.S. ambassador-at-large for international religious freedom, criticized Sudan's government amid protests against longtime President Omar al-Bashir during an interview with The Associated Press. He also lauded steps taken by the United Arab Emirates and promises made by Saudi Arabia while acknowledging far more needs to be done in those countries to promote and protect the right to choose one's faith. "No, it's not enough but it's something," Brownback said in the Emirati capital of Abu Dhabi. "They're not perfect countries by any means nor is the United States . but what I really think we need to do is to start people on a process and on an engagement moving forward." Brownback, a Republican who served in the U.S. Senate and later as the governor of Kansas for two terms, said he traveled to Pakistan to discuss the country being newly placed on the blacklist, which can lead to a nation facing economic sanctions. Pakistan, home to some 200 million people, has blasphemy laws that carry an automatic death sentence for a conviction of insulting Islam. Blasphemy allegations alone can lead to deadly mob violence. The U.S. put Pakistan on its religious freedom blacklist in December, though U.S. Secretary of State Mike Pompeo held back on imposing sanctions on the U.S.-allied nation. Brownback told the AP he met with Pakistan's foreign minister, who promised to appoint a point person to handle the U.S. concerns. "They've had a lot of difficulties as a nation on this topic on religious freedom so what I was there for was to talk about changing," Brownback said. However, Brownback acknowledged there are repeat offenders on the blacklist, like U.S. ally Saudi Arabia. He praised King Salman and Crown Prince Mohammed bin Salman, saying "the language coming out of the leadership is substantially different." However, Brownback himself brought up the assassination of Washington Post columnist Jamal Khashoggi at the Saudi Consulate in Istanbul, calling it "a horrific thing that went on." "They've got a long way to go," he said. Brownback, who converted to Catholicism in 2002, praised the UAE for hosting the recent visit of Pope Francis. The pontiff's visit and his Roman Catholic papal Mass both were the first on the Arabian Peninsula, the birthplace of Islam. Brownback also praised an Emirati effort to examine school books for children. However, he acknowledged the limits of religious freedom in the UAE as proselytizing by non-Muslims remains illegal. Conversion from Islam to another religion is illegal. Blasphemy and apostasy laws also carry a possible death sentence. "Even though we're in a "Year of Tolerance" here in the UAE, and I applaud that, tolerance is too low of a bar," Brownback earlier told a group of local journalists. "We need respect between the religions. They need to respect each other as this is a legitimate search for God. Whoever it is and whatever you believe, this is this is your heart's search. And that is your right as a dignified human to do it." A member of the UAE's government-run National Media Council later criticized an AP reporter's question about religious freedom in the Emirates during a news conference with Brownback. President Donald Trump picked Brownback to serve as the U.S. ambassador-at-large for religious freedom in 2017, though he only became ambassador in 2018. He had faced criticism from Democrats and LGBT groups over rescinding an order while governor that barred discrimination based on sexual orientation or gender identity in Kansas. Brownback opposes abortion and gay marriage. Brownback as governor also ordered state agencies not to help resettle Syrian refugees amid that country's yearslong war. 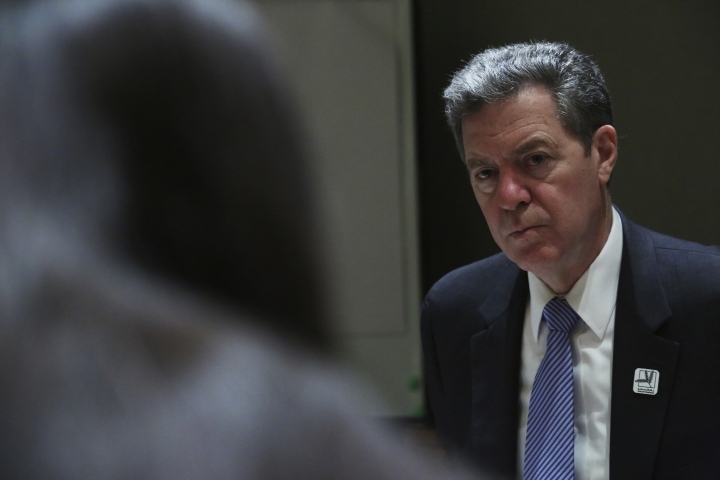 As a senator, Brownback paid particular attention to the conflict in Sudan's Darfur region. Asked about the ongoing protests there, Brownback declined to say whether he personally thought al-Bashir should leave. "The government there has just been terrible on how it's let its own people not be free and has persecuted their people for years and years and years," Brownback told the AP. "They've had a genocide in Darfur, they had a genocide (in) what they did to the Southern Sudanese, they continue to be a huge violator of religious freedom and I don't think they've served that nation well at all."